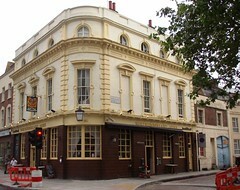 Basic old-school boozer in King's Cross, located on King's Cross Road. Bare floorboards lie underfoot, a fruit machine flashes silently, and a couple of flatscreens perch near the ceiling. An alcove to one side holds a pool table. Kake visited on a Thursday evening in March 2010. It was busy when I arrived around 5:30pm, though I managed to find a seat. It got noisier and busier an hour later, when the flatscreens were switched on to show a football match. There are no handpumps, so I had a pint of Strongbow (£2.20), served in a chilled glass. Crisps were 60p/packet. Although it was very busy and the barstaff hardly had a moment to draw breath, service was cheerful and friendly. The lady who served me remembered what I was drinking when I went back for another one, and took time to stop for a brief word with me when she passed my table later in the evening. Kake's verdict: I'd go back if I needed somewhere to meet in the area. Last visited by Kake, 11 March 2010. Last edited 2011-06-26 14:29:42 (version 2; diff). List all versions. Page last edited 2011-06-26 14:29:42 (version 2).